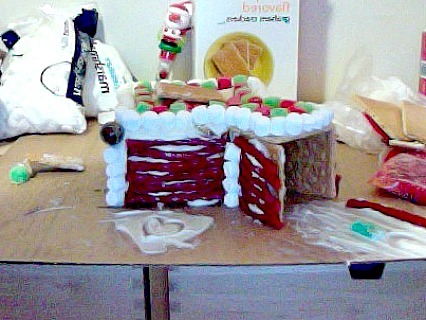 If you recall, Jordan and I held our First Annual Gingerbread House Building Competition last night. We invited eight people (plus us) to make five teams of two with only one rule: no frosting on the carpet. I have since declared myself official judge and am now, proudly, announcing the winners. Here we go! It’s a wintry wonderland up in here. 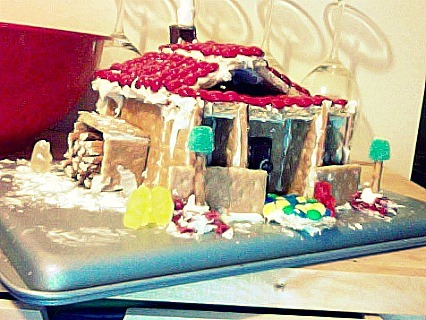 Jess and Wonsor made a gingerbread trailer park. I’m going to go ahead and say that Jess was the leading force behind this one, but let’s not count Wonsie out: he takes direction really well! This house looks like it could be featured in a Martha Stewart catalog. 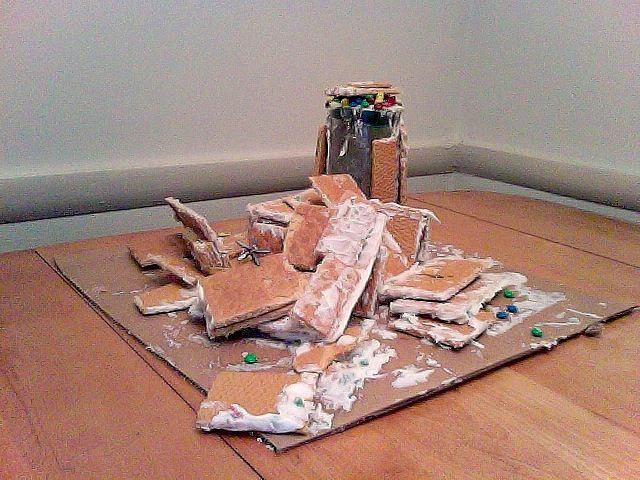 Seriously, Jess was cutting graham crackers into triangles to fill in the rooftop peaks. Have you ever tried to cut a graham cracker? I can’t even break them on the perforation lines! Anyway, congratulations, Jess and Wonsie! Most creative! This one is mine. It’s a quaint little cabin with authentic front porch and gumdrop lamp posts, as well as a chimney billowing real marshmallow smoke! Jordan made the nifty woodpile on the left side and dusted it all with snow. He then left me to help Alex and Rob. 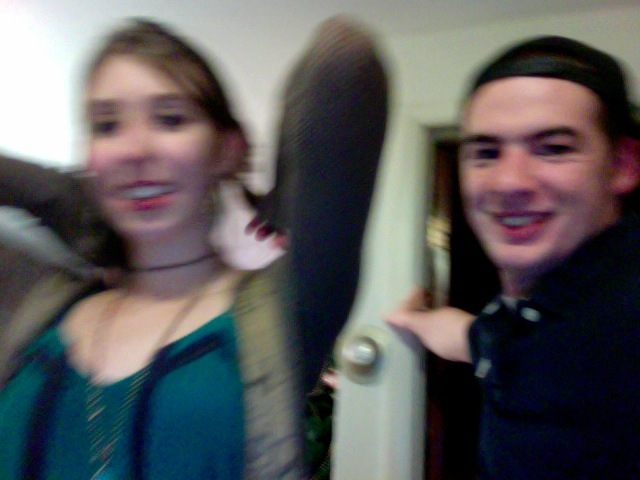 That was about ten minutes into the party. It would have hurt more, but once you see Alex and Rob’s house, you’ll understand why I forgave him so quickly. Extra points for the heart made in frosting on the lawn. Ah, here we have the eye-catching (and sturdy) house of Alex and Rob. In fairness, this house began with a really great turret and a two car garage. Both of those things lasted less than fifteen minutes. It was two floors at another point, but again, not for long. Jordan pitched in by covering one of our drinking glasses with icing and tossing that in there, because why not. Oh, there also seems to be a small plane rising out of the ashes of this house. Fantastic. =P For the record, Alex and Rob, although perhaps not architectural prodigies, are wonderful people and have many other redeeming qualities. Do you feel as jealous as I do? 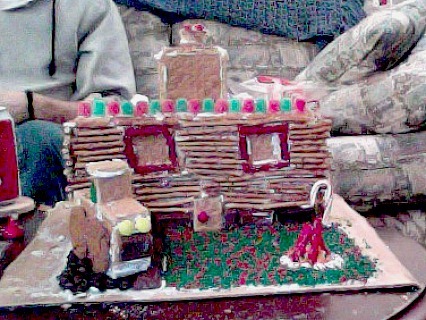 So here we have a legit pretzel log-cabin with double graham cracker walls (one cracker + frosting + another graham cracker) an M&M driveway, a green sprinkle front yard complete with Twizzler fire pit, gumdrop rooftop, a second floor, and to top it all off, a graham cracker/ginger snap pick up truck with M&M headlights. 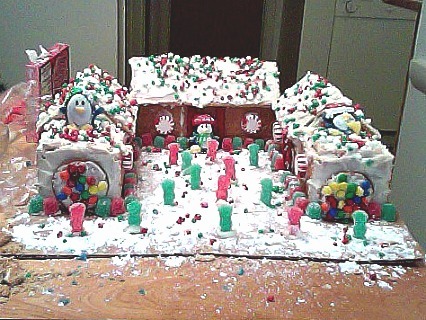 Megan and Kyle are the proud builders of this fantastic home and are thinking about taking their gingerbread skills on the road. They could hold gingerbread house building seminars, write books, teach lessons. They could go pro. (I don’t have any proof, but I think one of them must be a direct descendant of Frank Lloyd Wright.) Congratulations, Megan and Kyle! We had so much fun making these with our friends and are already looking forward to next year!